Astro-archaeology has brought remarkable new revelations about the mystical sciences of antiquity. It is now accepted that astronomy played an enormous part in an ancient, sacred science that has left its mark over entire landscapes, from stone circles and leylines in Europe to Egypt's pyramids and the ceques of Cuzco. 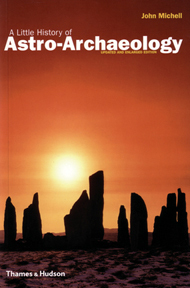 Chapters include: An Idea in its Infancy; Sir Norman Lockyer in Egypt; Stonehenge; Objections to Lockyer; The Old Straight Track; ‘Prehistoric Nationalism’: the Strange History of Astro-Archaeology in Germany; Stonehenge ‘decoded’; Alexander Thom and the Modern Revival of Astro-Archaeology; Lines Across Landscapes; Mystical Approaches; Lines and Alignments in South America; Conclusions: Astro-Archaeology as Geomancy; more. Imported from Britain. A LITTLE HISTORY OF ASTRO-ARCHAEOLOGY, Stages in the Transformation of a Heresy by John Michell. 128 pages. 6x9 Paperback. Illustrated. Sources. Index.